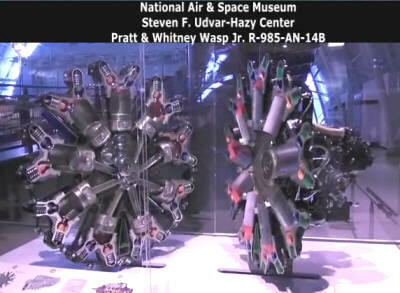 During a visit to the Steven F. Udvar-Hazy Center, part of the National Air & Space Museum, I videoed this animation of an actual Pratt & Whitney Wasp Jr. R-985-AN-14B radial engine. Bulldog Powers, the propulsion engineer, handles the narration as he describes the workings of the internal components. The entire engine has been cut down the middle through the cylinders, allowing visitors to watch all 9 pistons go up and down as their respective valves are opened and closed by pushrods. The video begins with the two halves fully closed and then they slowly move apart while the internal action is taking place. All the bare metal components are shined and key components are color-coded to follow the narration. Some guy watching me video the show asked me if I was so interested in the engine because I was an aircraft powerplant mechanic. There is some irony in that since when I signed up for the U.S. Air Force, my "guaranteed" job was supposed to be as a weather equipment technician. When that fell through, I was asked what other career field I would prefer so I chose jet engine mechanic. Well, that wasn't available either so I got my third choice as an air traffic control radar maintenance technician. It turned out well, but often I wish the mechanic job had worked out so I could have spent a lifetime working around airplanes. The Wasp Jr. is one of the most successful reciprocating engines ever built. Pratt & Whitney introduced it as a complement to the highly successful Wasp and Hornet families of engines in 1930. The Wasp Jr. was essentially a Wasp of reduced dimensions. Pratt & Whitney and its licensees manufactured over 39,000 versions of the R-985 until 1953 for a wide variety of military and commercial aircraft, including light transports, trainers, sport aircraft, and helicopters. The R-985-AN-14B powered the McDonnell XHJH-1 and XHJD-1 Whirlaway helicopters and the Avro Anson V trainer. This Wasp Jr.-aptly nicknamed "The Dancing Engine"- has been sectionalized and motorized to demonstrate the movements of its internal components. Overall - aluminum and steel. Type: Radial, 9 cylinders, air cooled Power rating: 336 kW (450 hp) at 2,300 rpm Displacement: 16.1 L (985 cu in) Weight: 309 kg (682 lb) Manufacturer: Pratt & Whitney Aircraft, East Hartford, Conn. Cutaway; with moving parts.